When is a good age to take your child to Walt Disney World? 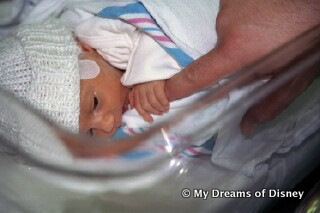 Sophie in her first days! The other day I was having lunch with a co-worker, and he mentioned that his son and daughter-in-law had recently had a baby! Little Jacob will be celebrating his first Christmas this year. Being the Disney planner that I am, we immediately started talking about wondering when they would take their little one to Walt Disney World for the first time. There are several pros and cons about when to visit Walt Disney World, so if you have a young one, and are considering a trip to Walt Disney World — but aren’t sure — these tips may help you decide when the time is appropriate for your family! If your child is under the age of three, then they don’t need a park ticket, and they can share the food from your plate without charge. Basically, under three is on Disney’s Dime! With a young one, your trip to Walt Disney World is often taken at a more relaxed pace. For example, a typical day includes waking up, eating breakfast, going to the park, riding some rides, coming back to the resort in the afternoon for a nap or for the pool, and then going to the park in the early evening. Disney does everything right — and one thing that you will love if you have a small child is the Baby Care Centers located at each of the parks! We never needed them, but I understand they can be a Godsend to parents, so take advantage of them! If your child has no aversion towards any of the characters, some of the best photos you can get are of your child with their favorite character. 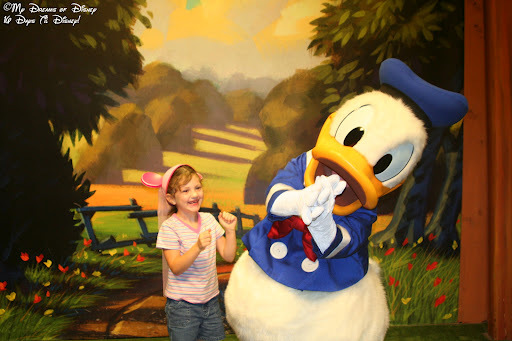 Take a look at this picture of Sophie and Donald Duck! Lastly, perhaps the best positive for taking your young child to Walt Disney World is the memories that YOU will have of your child’s first time going to Disney. While it is possible that your child won’t remember much of this trip — depending on their age — that isn’t the only consideration. Of equal importance is that you will remember those incredible memories, and they will live with you the rest of your life. Do you or your child have any aversions to traveling during times when there are a lot of visitors? If you are worried about that, there are steps you can take, such as investing in Safety Tats — a temporary ID tattoo to identify your child. However, if you are concerned, then you might want to hold off on your visit for a while. Does your child get scared of the characters that you see in your local area — team mascots, etc.? If so, then they probably won’t like the characters at Walt Disney World — but that isn’t always the case! Of course, this doesn’t mean that you can’t go to Disney, you could choose to avoid those situations if you like. Do you think that this might be the only visit for your family to Walt Disney World for several years? If so, then you will certainly want to plan your visit around a time when your children will remember their visit also. Is your favorite park a park such as Epcot or Disney’s Hollywood Studios? If so, you should plan on spending most of your days at the Magic Kingdom or Disney’s Animal Kingdom parks — those parks tend to have more things that are family oriented and less that is for older kids. In the end, it really comes down to you and your child. No one knows their child as well as its parents, and in the end, the parents will know if their child is of the right age to be able to enjoy their trip to Walt Disney World. The worst thing you can do is force Disney on them and have them end up not liking it at all — ever! For Cindy and I, we didn’t take Sophie to Walt Disney World until she was age four — and in her eleven years, Sophie has been to Walt Disney World nine times now! I hope that these tips have helped you to figure out when to best take your child to Walt Disney World. Are there any tips that I’ve left off? If so, please leave them in the comments below, and thanks for stopping by!